With this drift velocity calculator, you can compute the velocity of any charged particle in a specific material. Have you ever wondered what is the current speed in a cable? How fast does electricity travel? Read on if you want to find the answers to these questions. The drift velocity is the average velocity that a particle (e.g., electron, electron hole, ion) attains in a material due to an applied voltage. To determine the drift velocity, we need to know the number density, which tells how many carriers are in the volume unit of material (it is usually expressed in carriers per cubic meter). In the text below, we have presented the drift velocity equation and some simple calculations of the velocity of an electron. You may also be interested in how a charged particle behaves in the magnetic field (check out Lorentz force law) and what is the force acting on a wire with electric current in a magnetic field (check electromagnetic force on a current-carrying wire), but all that becomes complicated very fast and for now we would stay away from cross products and other mathematical complications. An electric current is a movement of electric charges (usually electrons) in a wire. It may be a surprise, but these particles have a limited velocity. When you connect the electrical device to the socket, it immediately reacts. So how fast does electricity travel? We have conducted some basic calculations of drift velocity for an electron in the text below if you want to learn more about it. We can already say that current speed is relatively small, but there are a massive number of electrons which simultaneously feel an applied voltage. That's why our electrical device reacts so fast after connection to a socket. q is the charge on the charge carrier. 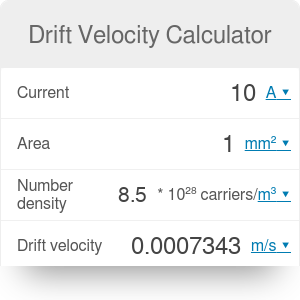 The simple mode of our drift velocity calculator assumes that a current appears as a result of the flow of electrons with the elementary charge q = e = 1.6 * 10^(-19) C. If you want to change the type of charge carrier, go to the advanced mode. Let's, for example, calculate the velocity of electron in a thin copper wire (A = 1 mm²) with an electrical current I = 10 A. Copper is a conductor that has a density of 8.94 g/cm³, an atomic weight of 63.546 g/mol and one free electron per atom. Using those informations and our number density calculator you can estimate the charge carrier number density n = 8.5 * 10^(28) electrons/m³. Finally, we can compute with our drift velocity calculator that u = 7.343 * 10^(-4) m/s which is surprisingly slow! Drift Velocity Calculator can be embedded on your website to enrich the content you wrote and make it easier for your visitors to understand your message.